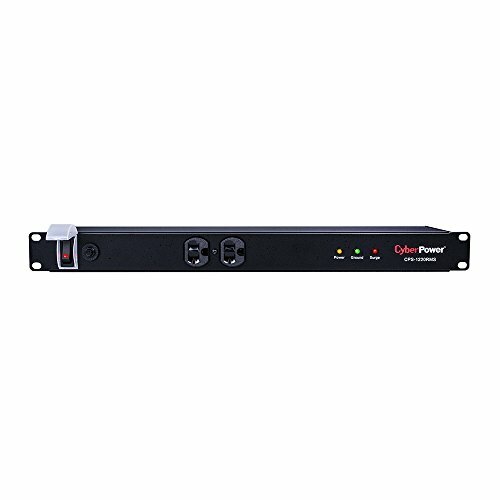 Engineered for the most demanding applications, the professional-grade Rackbar™ Surge Protector CPS1220RMS from CyberPower safeguards systems and networking equipment by absorbing spikes in energy caused by storms and electrical power surges. Designed for network environments, the CPS1220RMS also performs superbly for home office use, providing 1800 joules of protection, 20-Amp electrical capacity with circuit breaker, and 12 surge-protected outlets (2 front, 10 rear). Industrial-grade metal housing keeps this Rackbar performing flawlessly. The CPS1220RMS has a 1U racksize and can be mounted vertically or horizontally.Features of the CPS1220RMS include an EMI/RFI noise filter, industrial-grade metal housing, AC power cord (15 ft.). The CPS1220RMS also comes with a three-year limited warranty.